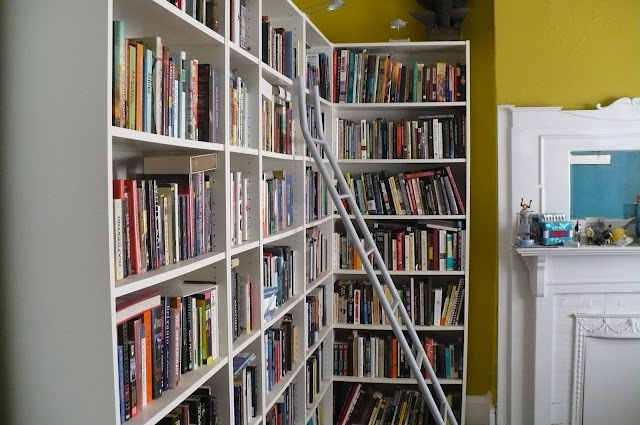 Oh, I love nothing more than to ogle people’s bookshelves. Not to judge, just to better know them… (Usually.) 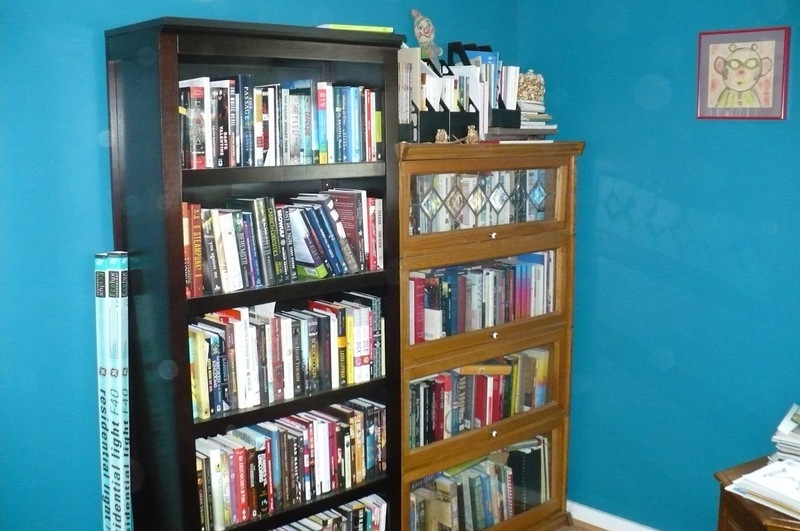 People without bookshelves? Deeply suspicious of them, but luckily I don’t know any. Without further ado, I’ll show you some of mine. My shelves aren’t just mine, of course—they’re also my husband Christopher’s. We have very sympathetic taste as readers, though most all of the YA titles are mine and all the space opera his. And when we first got married we did a massive cull. Something we should probably do more often, as you’ll see. We live in a hundred-plus-year-old-house with very high ceilings, and a few years ago we invested in a slew of Ikea Billys plus extenders. These house the mass of our books, if not all of them. They’re semi-alphabetical, because Christopher likes that sort of project, but have become less and less tidily alphabetical over recent years. That first photo is roughly A through F.
Above are the shelves extending into our office. 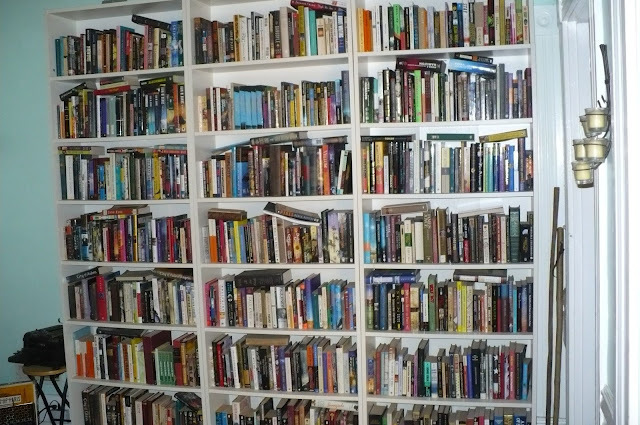 Most of the rest of the alpha-ished fiction (fantasy, SF, mystery and ‘literary’ stuff, mainly), anthologies, comics, and a smattering of nonfiction reference titles live in this room. Also, the library ladder. Isn’t it lovely? If I was better prepared, I’d have taken these with the lights on glowing luminously on the pretty spines. But it is day, and the effect just isn’t the same. You can see evidence of books sideways-ed rather than dealt with. This is because we have a space issue. 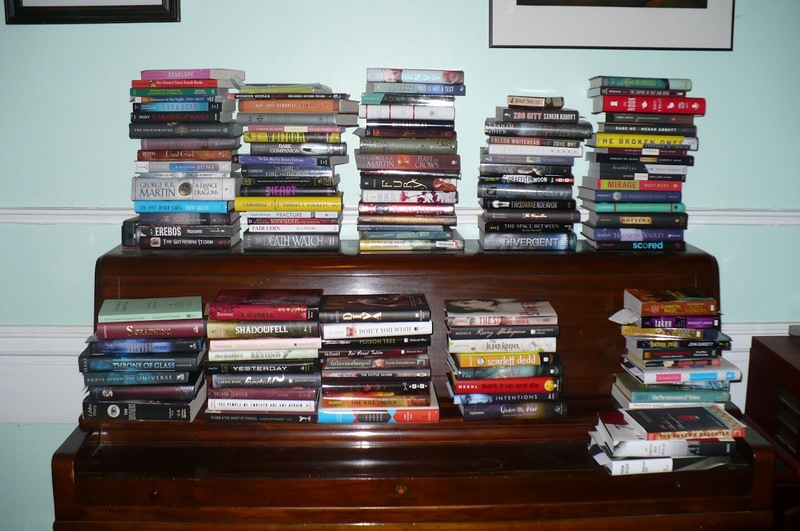 These are new arrivals, TBRs, possible review books that have colonized the top of our piano. And those also have overflowed into not-alphabetized-at-all shelves we constructed earlier this year to absorb some run-off and reclaim the guest room, which had disintegrated into shelf-like stacks against the walls. With the exception of one glassed-in shelf my grandmother gave us a few years ago, which houses mine and C’s author brag shelves (I guess I need to put Blackwoods in there now! Yay! ), along with cookbooks and nonfiction spillover. And that’s more or less it. Except for the poetry shelf in the bedroom. And the piles on the nightstands. We will never ever ever have enough shelves. We will always have too many books. Except that? Not possible. LOOOOVE bookcases that wrap around corners.. esp with ladders.